Websites which help people look up old flames on the net may be adding to the UK's rising divorce rate, it is claimed. 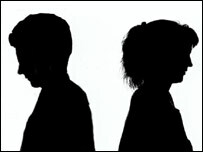 The number of couples getting divorced is at its highest level for seven years, official figures for 2003 show. Relationship experts at Relate said the increasing number of people going to websites like Friends Reunited to look up old partners was having an impact. Friends Reunited said it was only an intermediary and for each unhappy story there were hundreds of positive ones. Spokeswoman Carolynne Bull-Edwards told BBC News Online that almost 12 million people - around 47% of UK internet users - were registered on the site. "There are very, very occasionally unhappy stories. For every one unhappy story there are literally hundreds of happy customers," she said. "We are an intermediary delivering on our promise to reunite people. What happens beyond that is not within our control." But Christina Northam, a relationship counsellor for Relate, said: "Internet websites and chatrooms make having an affair easier and are among a whole host of reasons for the rise in divorce rates. "The first relationships we have are often very powerful and if we are feeling miserable we may be tempted to go to Friends Reunited to see what an old boyfriend or girlfriend is doing now." Divorce rates have risen over the past three years since falling back from the level reached in 1996, the Office for National Statistics said. The total number of divorces in England and Wales last year was 153,490, working out at 13.9 divorces per 1,000 married people. This rose from 13.4 in 2002. In almost seven out of 10 cases, the divorce was the first for both husband and wife. The average age at which couples split is increasing, at almost 42 for men and 39-and-a-half for women. Couples are also staying together for slightly longer, with the average up from 11.1 years in 2002 to 11.3 years before they part company. Just over half the couples who divorced last year had at least one child aged under 16. 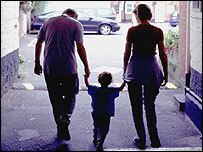 More than 150,000 children were in families where the parents divorced last year - and a fifth of those were under five. Denise Knowles, also of Relate, said: "The figures are very upsetting and have to be a concern for us all. "We need to make sure people are properly prepared for marriage because there is sometimes an unrealistic expectation. "People go into marriage thinking about the lovely wedding day and assuming the rest of your life will echo that but it is just the beginning."